The original “Cajun Party Band,” now known as “Cypress City,” began entertaining audiences in 1985. Within a short time, The Party Band was widely recognized for it’s uniquely entertaining, energetically laid-back, good-time style of performances. Cypress City “spreads it thick” when it comes to it’s roots. The guys are hardly Cajun traditionalists by any means, but they’ve successfully managed to blend the thick accents, effects from generations of unique eating and drinking habits, and simplicities and complexities of the Cajun life of old into a modern sound that’s just plain fun to listen to. Their music is mostly original and it’s been described as Cajun, Zydeco, Swamp Pop, Swamp Rock, Swamp Country, Swamp Funk, and probably even Swamp Hip-Hop. But who cares what you call it, they play music that people recognize and enjoy and they sound great doing it! 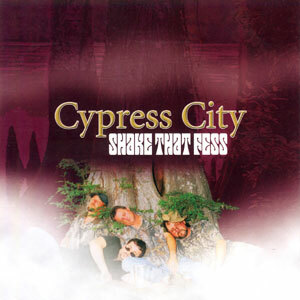 All four members of Cypress City were born and raised in Marksville, Louisiana. Growing up in the swamps and bayous of Avoyelles Parish, hunting and fishing has always been part of their lives. Avoyelles Parish, being in the center of the state, is sort of a cross roads for music and culture in Louisiana. These musicians were influenced by many styles of music, but the “Louisiana” sound has always been a part of their songs. Their first recording (& Louisiana smash hit), “The Cajun Rap Song,” was actually written while Dana “Juba” Normand, Keith Laborde, and Mark Ducote were frogging one night in Grande Lac, located in Louisiana’s Spring Bayou Wildlife Management Area known as the Sportsman’s Paradise. The song was meant to be funny and fun, focusing on the the band members’ lives and experiences. Reaction to their actions and music was mixed, though mostly widely enjoyed by all. A select few thought that the group was making fun of its own Cajun culture. The line, “We like the way we live, we don’t care if it’s wrong,” was meant to be interpreted as “We like the way that we live, even if you think that it is not the correct way to live, according to your culture,” and not singing about living by ignorant recklessness as some believe. The boys of Cypress City have always been proud of their unique culture and Cajun heritage. Cypress City formed in 1985 in the town of Marksville, Louisiana. They got the name, “Cypress City,” from all of the Cypress trees located in the Spring Bayou WMA, located outside Marksville. Lead singer/guitar/sax player Dana “Juba” Normand, and singer/bass guitar player Keith Laborde, had played in several local bands around central Louisiana. Eager to pursue a style of music that was different from the “norm,” yet still play the songs that people wanted, they set out to find members with diverse styles. They then found guitar player/singer Mark Ducote, keyboard player/singer Fabian Barbin and drummer Harold Laborde, who was replaced by Travis Gauthier in 1987. All of these guys had different musical styles, which allowed them to learn from each other and become awesome musicians and flourish as entertainers. Cypress City recorded their first record in 1987 at a local studio. “The Cajun Rap Song” was a novelty song about being a Cajun and having a good time. The first pressing of the song on their own MoonBeam Records label quickly sold out and the record was brought to the attention of Floyd Soileau, owner of Jin Records. Soon after, the vinyl 7″ Jin single of “The Cajun Rap Song” became a #1 Swamp Pop hit on Louisiana radio, along with the states of Texas, Mississippi, Alabama and more. The song caused some controversy among the listeners. People either liked it or hated it. Some thought it was stupid and that they were making fun of Cajuns. Others just enjoyed it because it was fun. It was that, “just plain fun”. Unfortunately, novelty hits don’t usually last very long and along with this small success, came business decisions, arguments and loss of band members. Joey Gaspard was added as a third guitar player and eventually replaced Keith Laborde on bass and vocals and Jay Walker replaced Travis Gauthier on drums. In 1992, Cypress City broke up and it was eleven years before any of these guys played music together again. Through these eleven years, members went through life’s hardships and problems but the music never left their hearts. Their perseverance, and the desire to perform, entertain and play music, eventually brought the band back together. In 2003, Dana Normand, Mark Ducote, Keith Laborde, and Jay Walker reformed Cypress City. This release is very entertaining for folks who enjoy Swamp Pop, Zydeco and oldies. These guys (Dana Normand, Keith Laborde, Mark Ducote and Jay Walker) revel in their roots, but they’re hardly traditionalists. “Fess” is Cajun slang for “booty,” by the way. There are a few covers here, including a fun-filled blast through The Swinging Medallions’ “Double Shot Of My Baby’s Love”; but those are only the tip of this Cajun iceberg. The Cypress City guys seem to have the most fun when playing something they can infuse with roots and humor. In fact, the most entertaining songs here reference Cajun life and food: the bass-bumping “I Want Some Couche-Couche” (a holler-along anthem vocally similar to “Who Let The Dogs Out”) and the hilarious “Cajun Rap Song,” which combines goofy lyrics and a busy rhythm track (“We like da way we live, we don’t care if it’s wrong; so we just gonna sing da Cajun Rap Song. “Little Bird” and “Raindrops In Heaven” are heartfelt rock ballads reminiscent of Fats Domino and, closer to home, Ray Fournier; but the funny, gimmicky songs really hit home for this listener: “Crawfish Man,” (“Come on baby…bite me.”), Redbone’s “Marie Laveau” and the aforementioned rhythm bumpers. Cypress City avoids offensiveness in favor of providing a cool party album. But these funny guys can get the bellies rubbing on swamp pop-flavored numbers like “My Baby’s Gone” and “What Would I Do?” All body parts get a workout with Cypress City.